It’s fairly common knowledge that a person can live about 8-14 days without water, and about 4 weeks without food, but do you know how long you can go without sleep? According to Scientific American, a person can stay awake for 11 days without serious permanent physical repercussions, although they have serious psychological side effects after 3 days. (www.scientificamerican.com) It is also common knowledge that prescription sleeping pills can be habit forming and only lead to greater anxiety and insomnia. Now studies show that prescription sleeping pills can be fatal. According to a study by Daniel F Kripke, Robert D Langer, and Lawrence E Kline, “if you take as little as one or two sleeping pills a month you are statistically three and a half times more likely to die than someone who takes none. • Patients receiving prescriptions for zolpidem, temazepam and other hypnotics [aka "sleeping pills"] suffered over four times the mortality as the matched hypnotic-free control patients. • Even patients prescribed fewer than 18 hypnotic doses per year experienced increased mortality, with greater mortality associated with greater dosage prescribed. There is even a significant increased risk of death, including fatal cancer risks, with just an infrequent use of these drugs. But don’t despair; there are safe, effective, and natural ways to promote healthy sleep. Some of these natural supplements include Vitamin B, magnesium, melatonin, L-5-HTP, valerian root, chamomile flower, and lavender. Our new and improved ProBLEN Sleep Aid contains many of these supplements and more. Our formulators have created the perfect blend of natural sleep aids to promote the healthiest sleep possible. So when you’re having trouble falling asleep or staying asleep, and you don’t want to risk your life, try all natural homeopathic ProBLEN Sleep Aid. It will not leave you feeling groggy in the morning and it is non-habit forming. 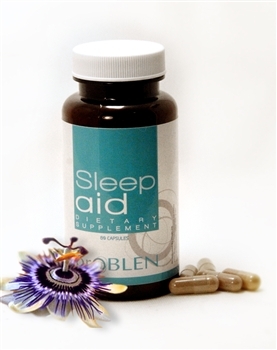 Get better, healthier sleep with ProBLEN Sleep Aid today! Sugar and the Body: What Happens? Think you might have a thyroid problem? Copyright problen.com. All Rights Reserved.